Astronomers worldwide will today (14th September) be able to access data from the Gaia telescope, as the European Space Agency (ESA) is set to release the first batch of data from the space-based observatory. 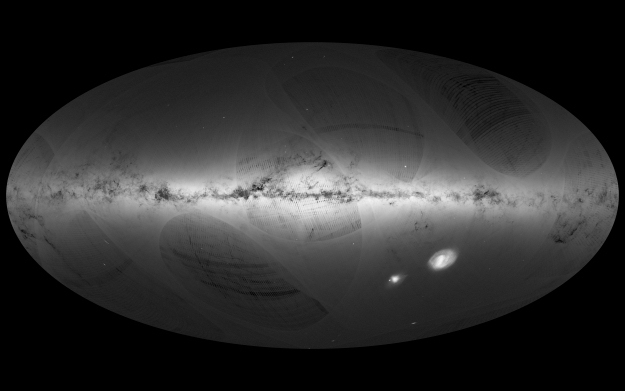 Gaia is an extremely ambitious space mission to chart a three-dimensional map of our Galaxy, the Milky Way. During its anticipated lifetime of 5 years, it will observe around 1 billion stars and other sources roughly 70 times each, resulting in a record of brightness, colour and position of each source over time. These data will allow astronomers to achieve breakthroughs in almost all areas of astronomy. "Along with the main goal of Gaia, mapping of the MW and studying its formation and evolution, the data will also lead to numerous new discoveries, including exoplanets (planets around other stars), asteroids in the solar system, and brown dwarfs (failed stars) to name a few" says Dr Sofia Randich, an astronomer at the Arcetri Observatory in Florence, and a member of the Gaia Science Team. Gaia is a fully European designed and built mission, and is made up of two telescopes facing different directions, that continuously scan the sky. It was launched on a Soyuz-Fregat rocket from the European Spaceport in Kourou, French Guiana, on 19 December 2013. Scientific observations began in August 2014, after a period of calibration and testing of the telescope. Now, after 2 years of observations, the first batch of data is ready to be released for astronomers to analyse. This release includes, among other things, three-dimensional positions and two-dimensional motions of a subset of two million stars, demonstrating that Gaia's measurements are as precise as planned, paving the way to create the full map of one billion stars which will be released towards the end of 2017. Astronomers at the Arcetri Observatory in Florence are playing a key role in the Gaia project, with Dr Sofia Randich on the Gaia Science Team(currently a group of 9 astronomers from across Europe) who advise ESA on the data analysis and everything related to the scientific performance and goals of Gaia. Dr Elena Pancino and Dr Aldo Dall’Oro are also part of the large group of scientists responsible for processing and preparing the ‘raw’ data from Gaia, and entering this processed data into a huge database (archive) so astronomers around the world can access this wealth of information. Such a vast library of data is “a game-changer” in astronomy, and will significantly improve our understanding of how everything from stars, galaxies and the Universe formed, and predict how they will evolve in the future, leaving almost no aspect of astronomy untouched along the way. With the release of this first Gaia data, a new era of astronomy dawns. Figure 1: An all-sky view of stars in our Galaxy – the Milky Way – and neighbouring galaxies, based on the first year of observations from ESA's Gaia satellite, from July 2014 to September 2015. This map shows the density of stars observed by Gaia in each portion of the sky. Brighter regions indicate denser concentrations of stars, while darker regions correspond to patches of the sky where fewer stars are observed.